The Cartier Tank Solo shares its rectangular case, blue cabochon-shaped spinel on the crown, and Roman numerals with the original Tank from 1917. The collection's highlight is the automatic Tank Solo XL in pink gold. In the watch industry, the Cartier Tank is considered an absolute classic. It has graced the wrists of many celebrities and become a staple in the world of the rich and famous. However, its unmistakable rectangular case actually has military origins. When crafting the Tank, Louis Cartier was inspired by the tanks used in the First World War. This tank-inspired design with elongated lugs still defines every watch in the Tank collection today. Cartier gifted the very first Tank to General John Pershing in 1917. The collection has stayed true to its roots for more than a century. 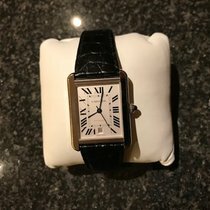 Both the Tank Solo and the Tank Louis Cartier are very similar to the original. Like the original, the Solo features the famous Roman numerals and two tempered sword hands. The blue cabochon-shaped spinel draws attention to the crown. This synthetic gemstone appears on every Tank Solo, as does a railroad minute scale on the dial. The Tank Solo comes in various sizes and materials, including stainless steel, yellow gold, and pink gold. The cases are combined with a stainless steel bracelet or a strap made of crocodile or calf leather. Most watches in this collection are quartz-powered, one exception being the Tank Solo XL. Those with an automatic caliber are easily recognized by the date display at 6 o'clock, which is missing on quartz-powdered Tank Solo models. How much does a Tank Solo cost? Prices for a quartz Tank Solo begin around 1,900 USD for pre-owned models in very good condition and 2,400 USD for never-worn timepieces. Cases in this price range are made of stainless steel. If you're in the market for a gold watch, prices climb to around 4,000 USD. This amount will get you a pink gold Tank Solo on a brown crocodile leather band. The Tank Solo comes in three case sizes: small models are 31 x 24.4 mm and pair best with more feminine wrists. Large models make great unisex watches and measure 34.8 x 27.4 mm. Finally, the 40.85 x 31-mm XL versions are best suited to larger wrists. The Tank Solo XL with a stainless steel case and bracelet demands about 3,500 USD. Prices for a new timepiece with a pink gold case and crocodile leather strap start around 7,700 USD. The Cartier Tank Solo stands out with its simple elegance and is a statement piece in itself. For this reason, the collection doesn't feature any models with diamonds. Those looking for a diamond-studded timepiece with the feel of the original Tank should take a look at the Tank Louis Cartier series. For example, there you will find a pink gold model with diamonds and an in-house manual caliber for around 23,500 USD. The Cartier Tank has taken various forms since its introduction in 1917. While the design has remained largely unchanged, the different series set themselves apart from each other via their finer details like the case size and proportions. The Tank Américaine, for example, has a domed and comparatively long case, which sits beautifully on the wrist. A quartz-powered yellow gold Tank Américaine in very good condition costs around 9,400 USD. The Tank Française is the sporty member of the Tank family and has a more square-shaped case. It is also available as a chronograph. The subdials sit at 4, 8, and 12 o'clock. 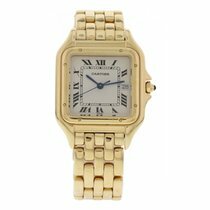 At 36 x 28 mm, this chronograph is a great choice for both men and women. In very good condition, this timepiece with a yellow gold case and bracelet sells for about 11,800 USD.